Dental implants have gotten a lot of attention over the past few decades. Their reliability, functionality, and natural aesthetic has made them appealing to many different groups of people. Those who experienced a dental injury and needed to fill the gap in their smile could so with dental implants. Those who were tired of wearing dentures could find solace in a treatment that rejuvenated their gums and jawbone as well as their smile. 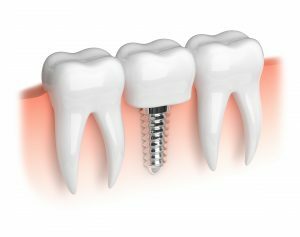 If you’re looking for the most effective method for replacing teeth, look no further than dental implants in Federal Way. Dental implants are so versatile, they can replace a single tooth, a few teeth, and even an entire row when placed by an experienced dentist. Typically, those who get dental implants had their tooth extracted due to decay or because of a dental injury. In that case, a prosthetic root is needed to complete their smile and sustain blood flow back to the tooth. After the implant is placed into the jawbone, a healing period of about 4 to 6 months is needed so it can osseointegrate with the bone. After this period, a porcelain crown is placed on top. Dental implants are treated just like natural teeth and don’t require any additional maintenance to maintain. In fact, dental implants stay in the mouth stronger because they lack a periodontal ligament. Additionally, the crown that rests on top is inorganic, which means bacteria will not be able to grow inside it. However, this does not mean you can forgo brushing, as the tissue holding it in place needs to be kept clean. A dental bridge has the ability to replace two more missing teeth in a row. Basically, two teeth on either side hold another tooth in between them, keeping it sturdy and making basic functions like speaking and eating easier. These replacements can also be supported by dental implants. With enough implants, you could potentially replace an entire row of teeth with bridges. This is ideal if you don’t want to use dentures or partial dentures to replace teeth. Got Dentures? See if You’re Eligible for Implant-Retained Dentures! If you’ve had dentures previously, you’re aware of the multiple ways they’re supported in the mouth. Typically, they stay through natural suction, but they can also be held through adhesives, brackets, or clips. However, the strongest and most reliable way to keep dentures or partial dentures in is via implants. If you’re eligible for implant-supported dentures, you’ll find many benefits compared to traditional ones. While dentures held by natural suction need to be relined multiple times to accommodate the changing shape of your mouth and jaw, implants keep your shape for many years. This means as long as you properly care for your dentures, you won’t have to rely on regularly relining them to fit correctly. Don’t let your smile suffer when there’s a solution available. Schedule a consultation with your dentist in Federal Way to see if you’re eligible! Drew Beaty, DDS, has been recognized as a “Seattle Top Dentist” from 2009 to 2016 by his peers in Seattle Metropolitan magazine and taken over 100 hours of continuing education in dentistry. After completing all 9 levels of postgraduate education at the Kois Center for Dental Excellence in Seattle, he’s proven his capability of providing the highest quality dental care possible to patients. To learn more about his dental implant treatments and practice, contact him at (253) 839-6544 or visit his website.